The William Joseph Thompson Papers were transferred to the University Archives from the University Library’s Rare Book and Manuscript Department in September 2015 (Accession Number: 2015: 037). The William Joseph Thompson Papers are organized into two series: Correspondence and General Files. Each series is arranged alphabetically. William Joseph Thompson (1864 – 1944) was a Methodist Episcopal minister, professor, and graduate of the University of Pennsylvania. Born in Dorchester County, MD., Thompson attended the University of Pennsylvania earning his B.S. in 1884. Shortly after he decided to enter the clergy and attended Drew Theological Seminary earning his B.D. in 1892 (being ordained a Methodist Episcopal minister that same year). Between 1892 and 1910 he served as pastor at churches in Washington, D.C., Maryland, New York, and Massachusetts. During his pastoral work, Thompson also earned an A.M from Harvard University (1901), and a Ph.D. from New York University (1910). He was also awarded honorary degrees from Dickinson College (D.D. 1906), and Hamline University (LL.D. 1913). In 1911 Thompson accepted a faculty position at Drew Theological Seminary as professor of religious psychology and pedagogy (a position he would hold until his retirement in 1934). In 1915, following the bicentennial of George Whitefield’s birth, Thompson wrote to Provost Edgar Fah Smith about the possibility of erecting a monument to Whitefield to honor his involvement in the founding of the University of Pennsylvania. Whitefield and Benjamin Franklin were close friends, and Whitefield’s Charity School was purchased as the site for Franklin’s Academy of Philadelphia and College of Philadelphia (predecessors to the University of Pennsylvania). Efforts by Thompson, Smith, and Orville S. Duffield (a secretary of the Christian Association) resulted in R. Tait McKenzie’s statue of George Whitefield dedicated in the Dormitory Quadrangle in 1919. Thompson died of a heart attack in New York City at the age of 80. The William Joseph Thompson Papers relates to Thompson’s efforts to erect a memorial to George Whitefield on the campus of the University of Pennsylvania between 1915 and 1919. The bulk of the collection consists of correspondence between Thompson, University officers and other interested parties related to the statue’s conceptualization, design, and dedication. The General Files series contains material on Whitefield, and the statue’s dedication. The collection does not contain any additional personal or professional papers of William Joseph Thompson. 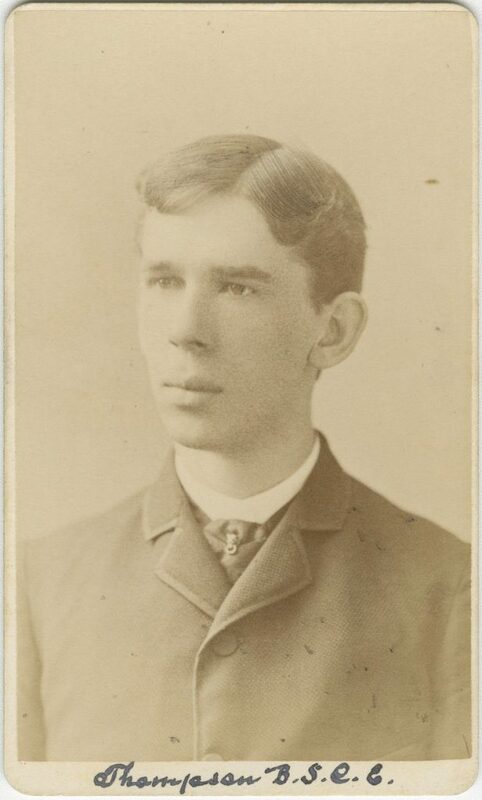 There is some biographical information and an image of Thompson in his Alumni Records File.